I watched an interesting movie the other day about the record retreat of many of the world's glaciers called 'Chasing Ice.' 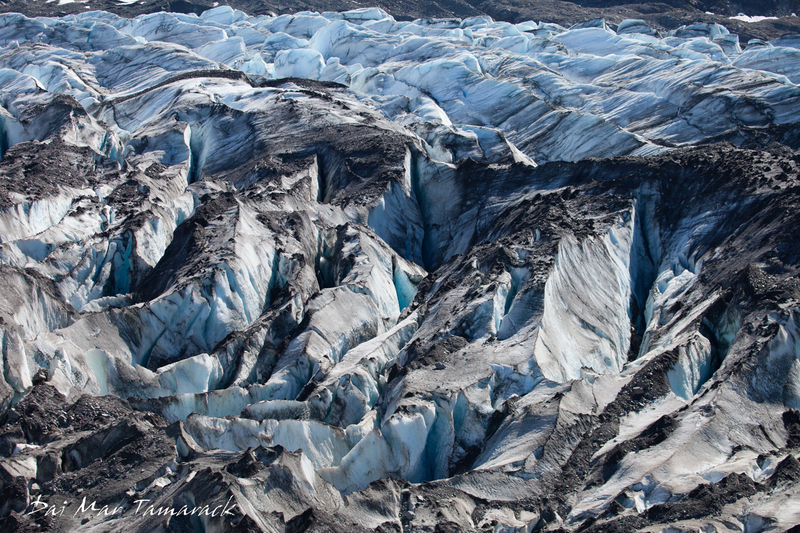 James Balog, a National Geographic photographer placed time lapse cameras in strategic positions looking over sixteen different glaciers. 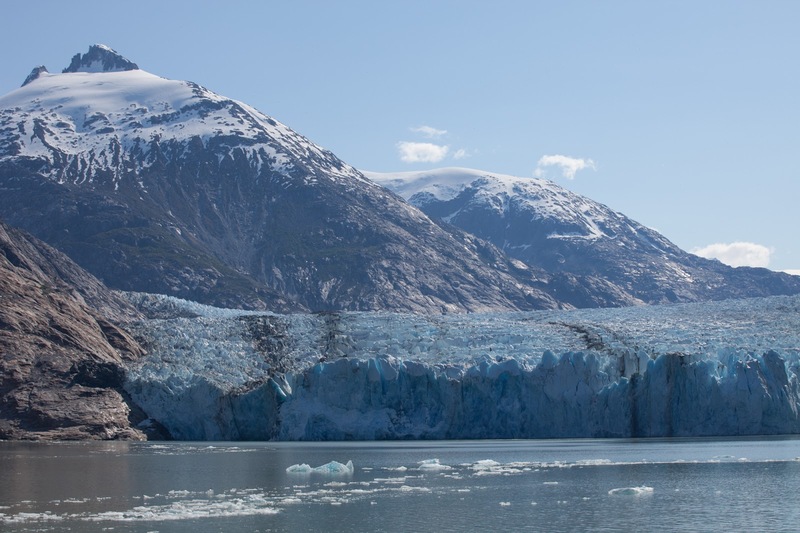 The resulting footage of these multi-year glacier time lapses give a striking visual to what scientists have been trying to say for decades. 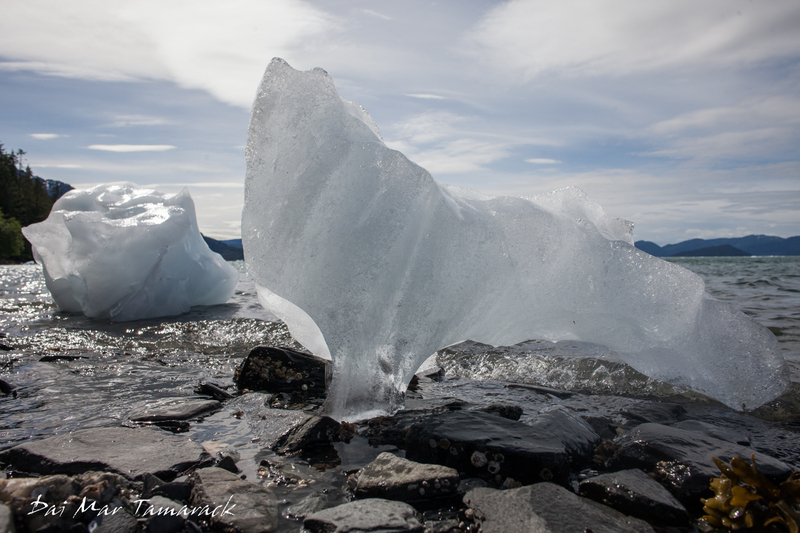 Inspired by this idea I have been trying to do my own glacier time lapses, albeit on a much smaller scale. While running trips with UnCruise in Southeast Alaska I have the opportunity to visit the same glaciers year after year. 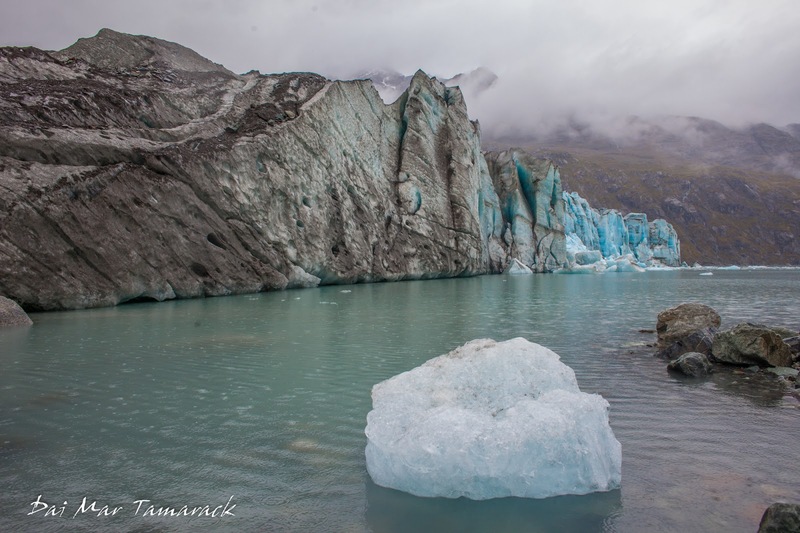 I try to get pictures from similar location and angles to allow a better understanding of the shifting face of the glacier at its terminus. 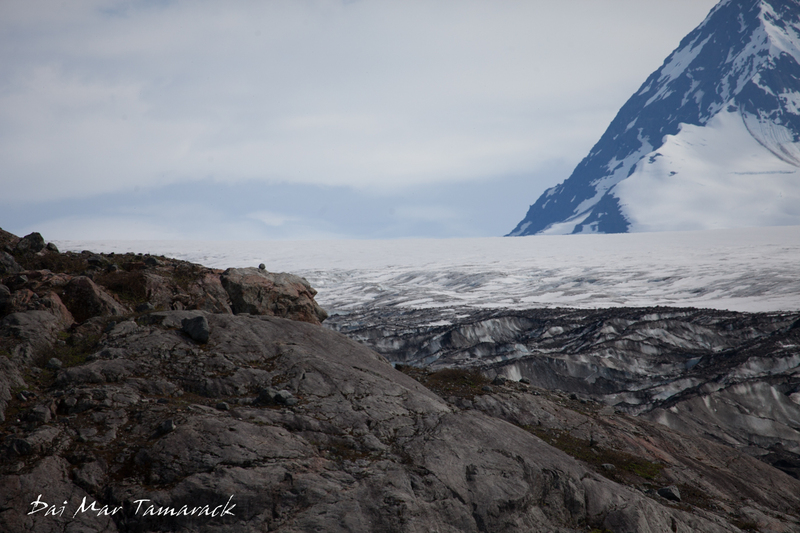 Here are a couple of glaciers with pictures from over the last 3 years. 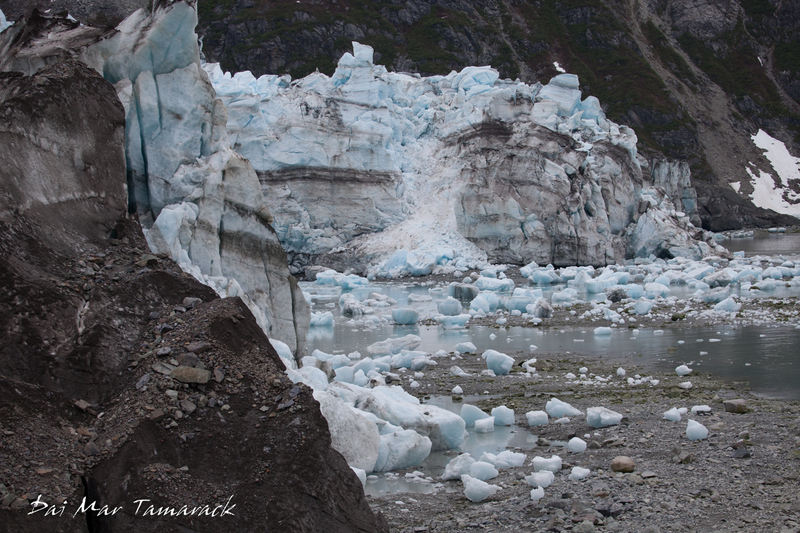 Lamplugh glacier above had the most dramatic change. Now it is pretty much completely grounded. Both of these pictures were from high tide. 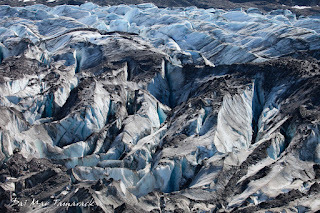 Dawes glacier on the other hand looks similar, although a bit of retreat on the sides, and a much lower face hint at the ablation, or loss of mass that is happening. 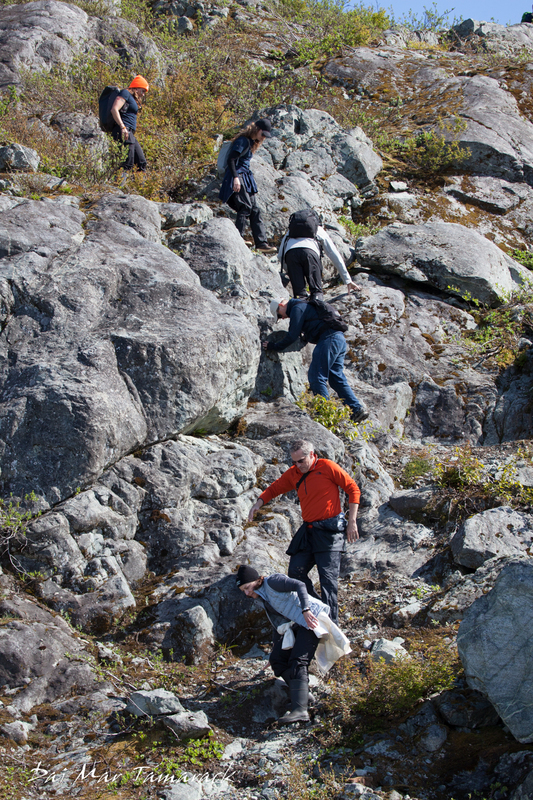 This hike is for the extremers, the 'go get em' bunch that doesn't mind some dizzying heights, near vertical scrambles, and some steep dropoffs. If that sounds like you then keep reading. 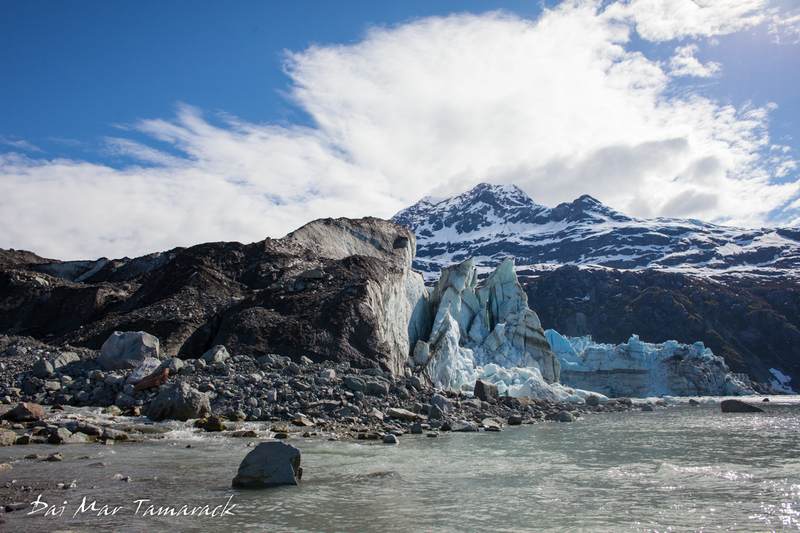 If not then maybe check out a calmer post about my first visit to Glacier Bay National Park three years ago. 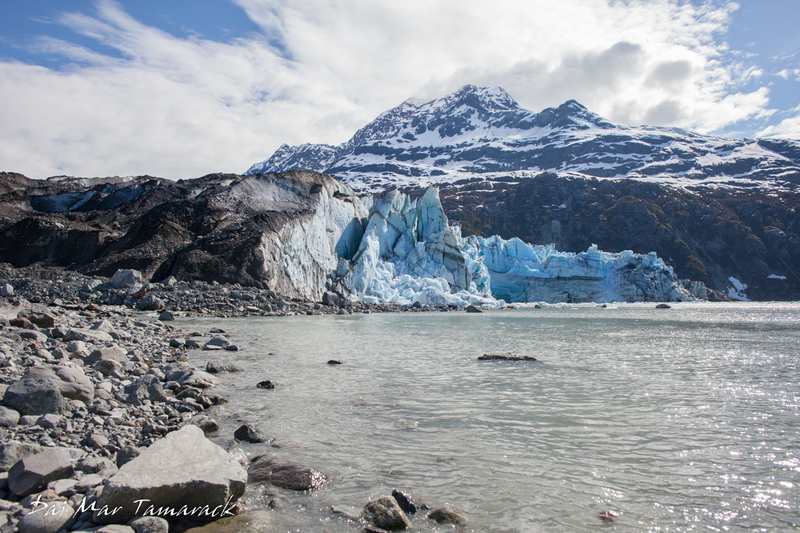 In the heart of Glacier Bay National Park there is Lamplugh Glacier. I have heard about the ridge hike which starts from the lookers left side of the glacier for years, but until recently I had never gotten a chance to tackle it myself. 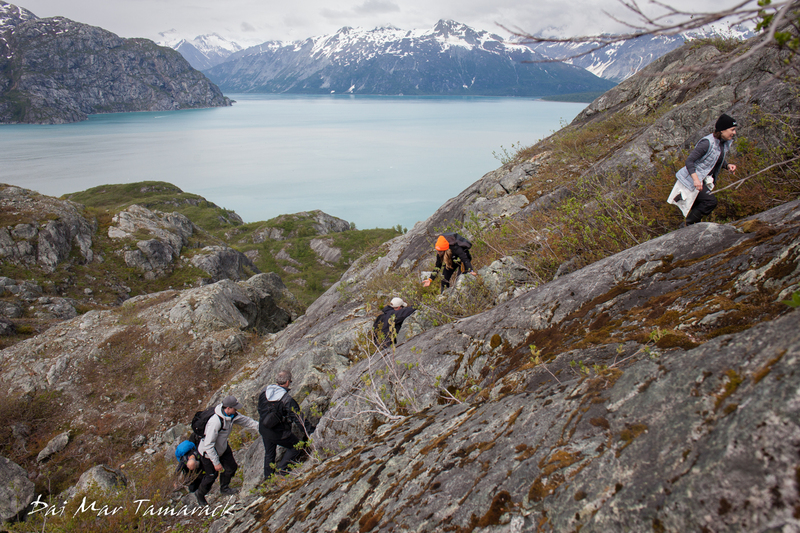 Last week I took a hard charging group of hikers from my boat, the Safari Quest, to see just how high we could make it, and what kind of views we could get. For parts of the hike there is a worn trail. The views of the glacier expanding below you, and of all the mountain range extending as far as you can see are more and more breathtaking the higher you get. We climbed to a spot where the obvious trail ends. Then with no prodding needed we continued to scramble out way higher. There are multiple peaks along the ridgeline so the next destination is always pretty obvious and there are lots of clear cut ending points whenever you are ready. After we had a few peaks under our belt the view of the glacier changed. We were able to see the top of the glacier extended off into the horizon. 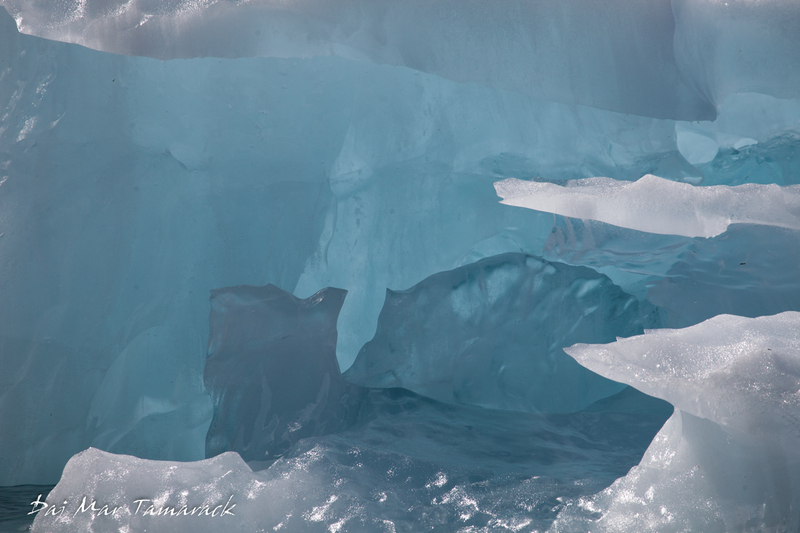 From here the top of the glacier looked more like a snow covered field than the deep blue crevasse filled terminus. 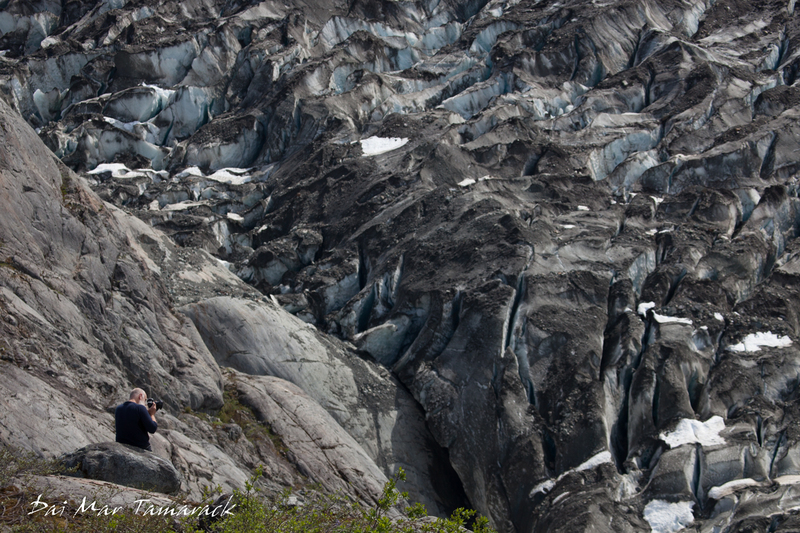 It was fun pushing ourselves and seeing a very different view of a glacier I have been visiting for three years. The lupine were starting to bloom so I imagine in a couple of weeks the entire hillside will be lit up by purple wildflowers. 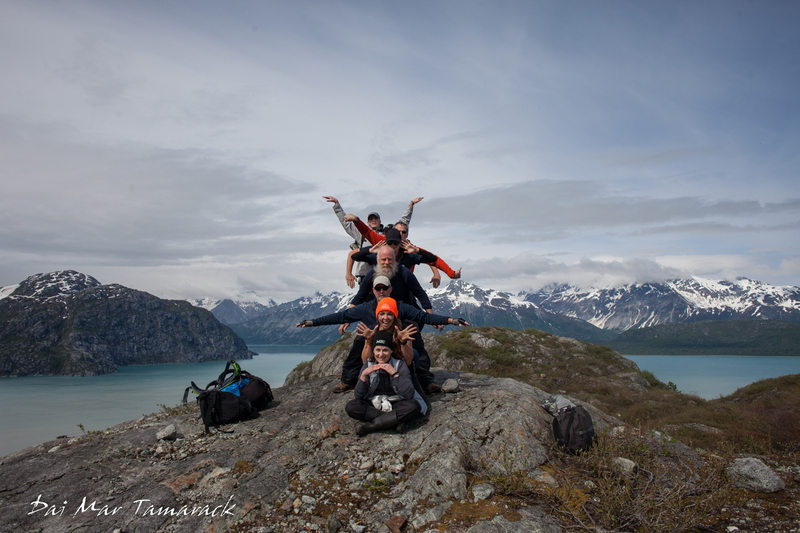 If you only have a change for one hike in the west arm of Glacier Bay then this should be it. If you are trying to figure out how to hike here in the first place...it's not easy. 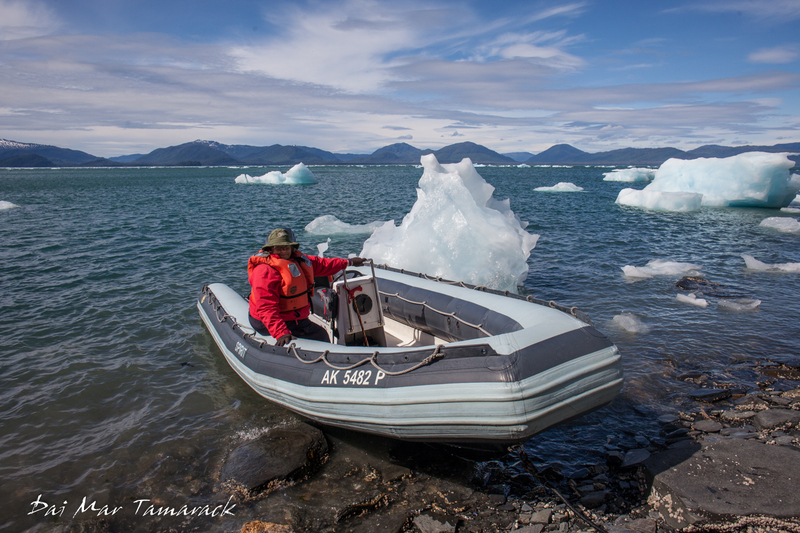 You have to come either by your own personal boat or kayak, or with one of the companies that does adventurous stuff like this in Glacier Bay, the only one of which that I know is Uncruise Adventures. They say coming down is the toughest part, and they would be right, although everyone did it in style and remained safe. 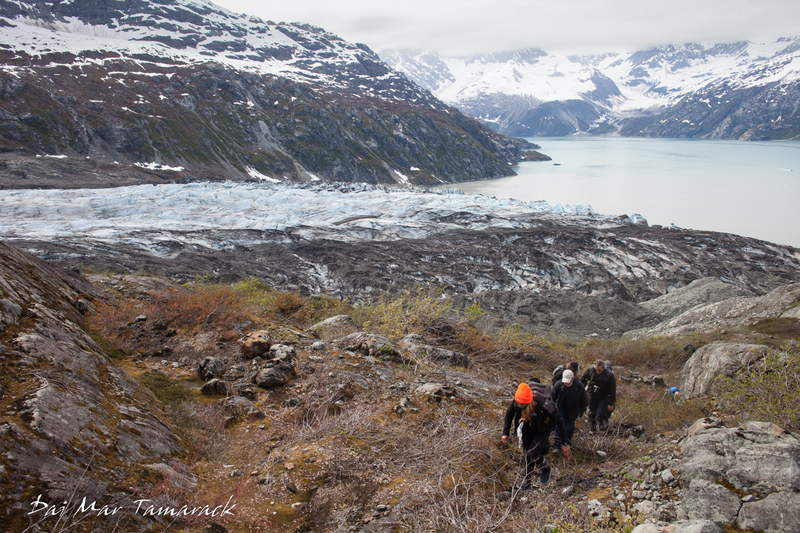 The Lamplugh Glacier ridge line hike....check and check. 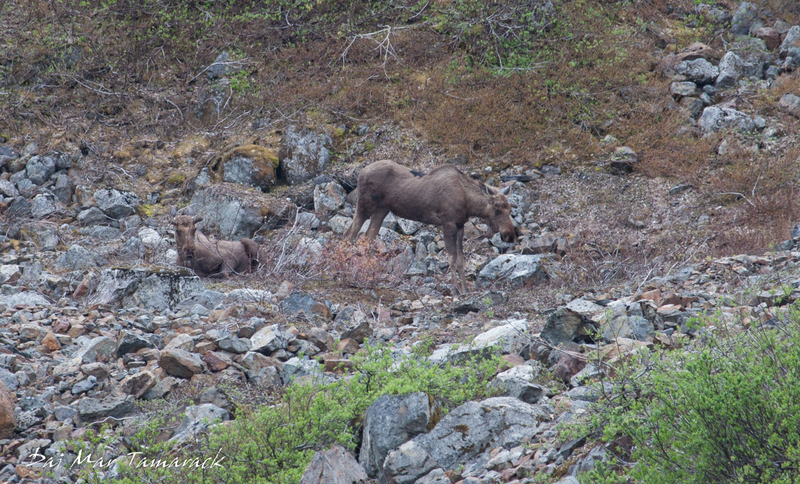 Moose are relative newcomers to Southeast Alaska. At least the ones that are here now. 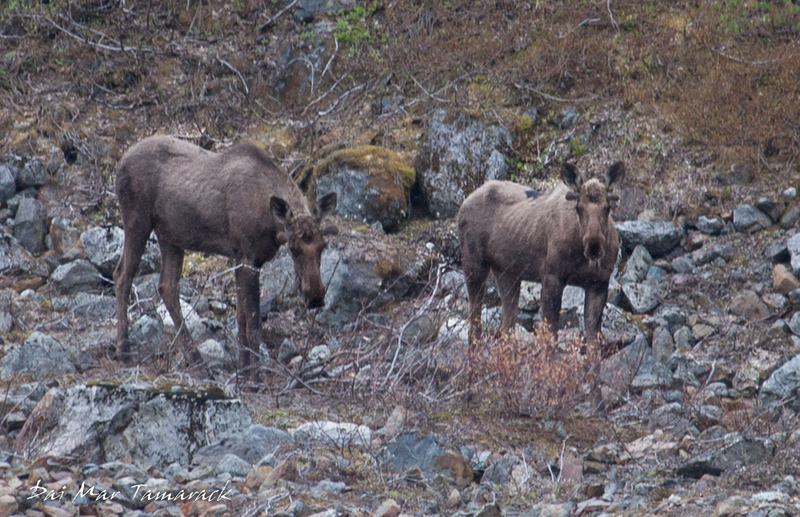 It is theorized that moose used to be here but went locally extinct, and recently a different subspecies of moose has moved in through the major river valleys like the Stikine near Petersburg and the Taku near Juneau. 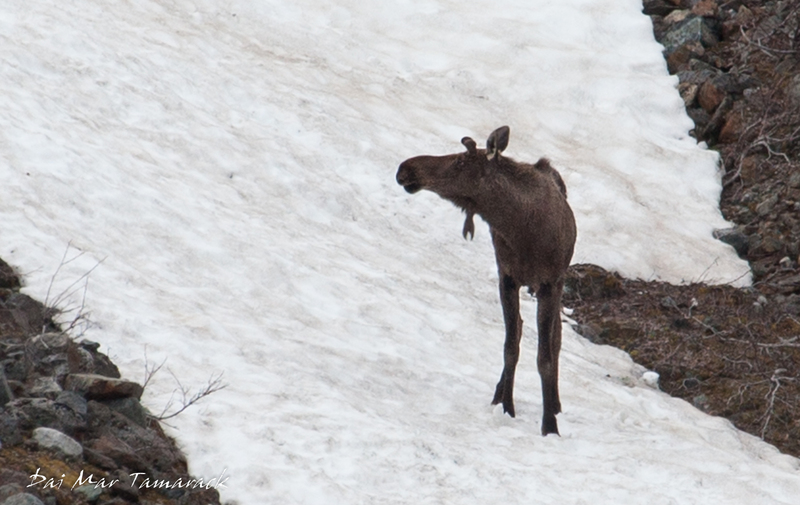 If you want to look deeper into the science and DNA research of our moose take a look at this interesting article from the Alaska Wildlife News. The fact that they are just now slowly colonizing means seeing them on one of our trips is a rare experience. Even for us running the trips it may be a once a season kind of sighting. Up in Homer and Denali we encountered moose around every corner, but here it is a rare thing indeed. 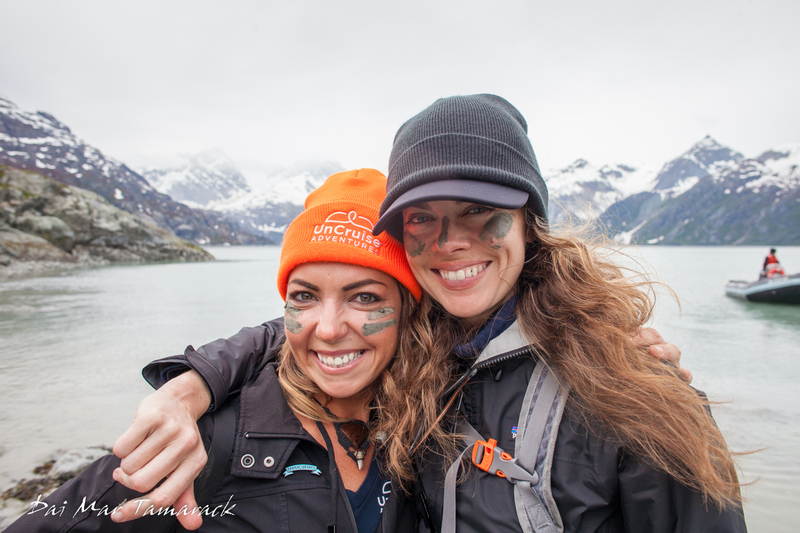 So you can imagine our surprise when two moose were spotted just above where we had anchored near Lamplugh Glacier in Glacier Bay National Park. One took a stroll out onto some ice before calmly sitting down to take a rest. Check out www.daimartamarack.com for more. One of the greatest spectacles in nature is watching animals work together to hunt. 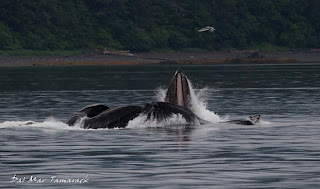 I have seen a pack of 13 lionesses taking turns to wear down a huge bull cape buffalo, and I've seen orca making an easy meal out of a speedy dall's porpoise, but something gets me every time I witness humpback whales bubble net feeding here in Alaska. I had heard reports of a couple separate groups of bubble net feeders working southeast Alaska but until last night I had been unable to locate them. 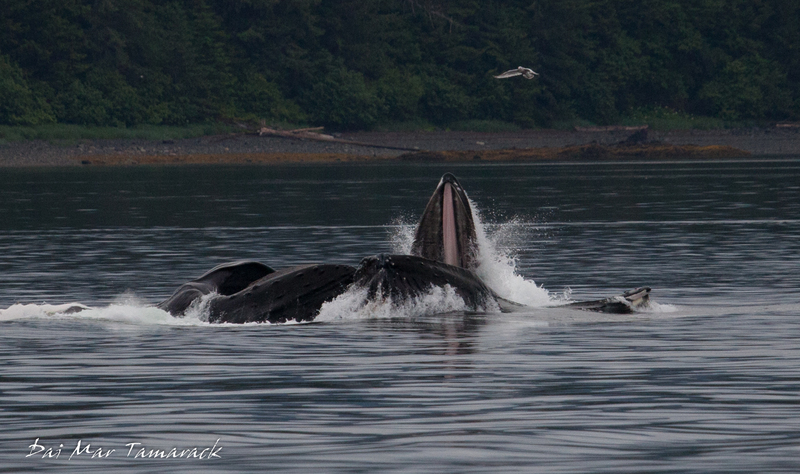 When I saw 4 or 5 whale blows very close together I had high hopes, and it paid off. 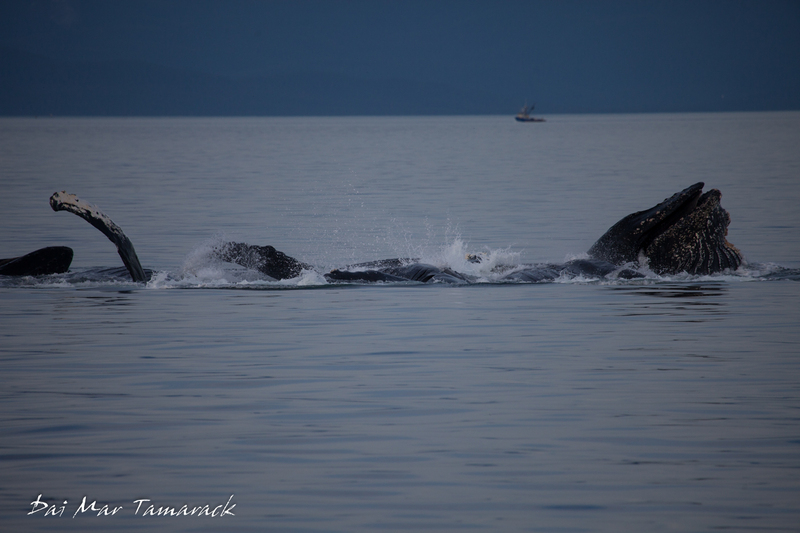 We took the Safari Quest in for a closer look and sure enough, 7 whales erupted from the water in a tight formation as the surrounding birds flew in to grab the fish spilling out of the huge mouths of the whales. 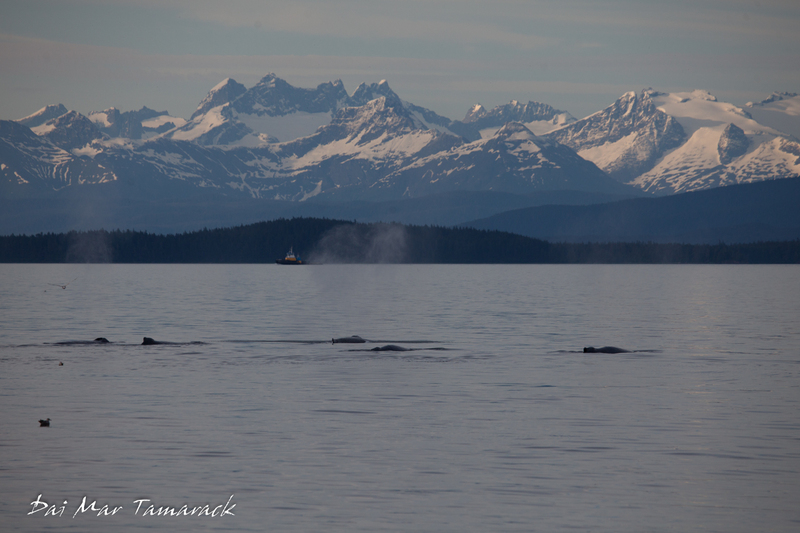 We stayed with the whales for around an hour before having to motor on south but the entire encounter summed up the essence of traveling through Alaska. 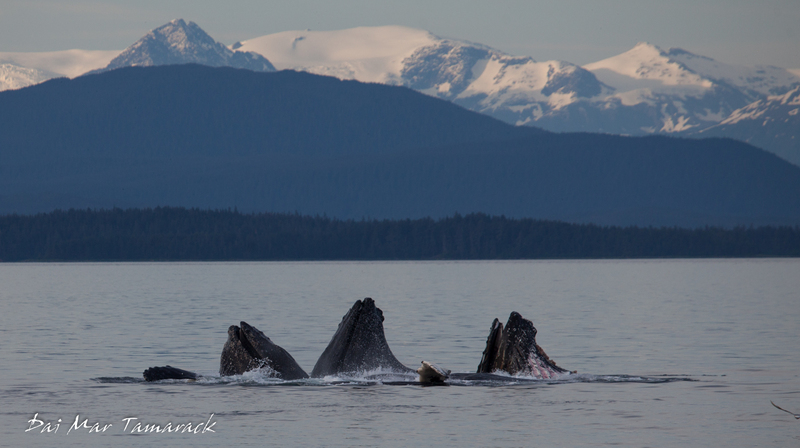 Hear we had these amazing wild creatures, participating in this national geographic type behavior, surrounded by islands covered in Old Growth temperate rainforest, with massive snow covered mountains in the background....all without another sole around. There were no whale watching boats, no roads, no noises of any kind except the gentle hum of our generators and the frequent exhalations of the whales. 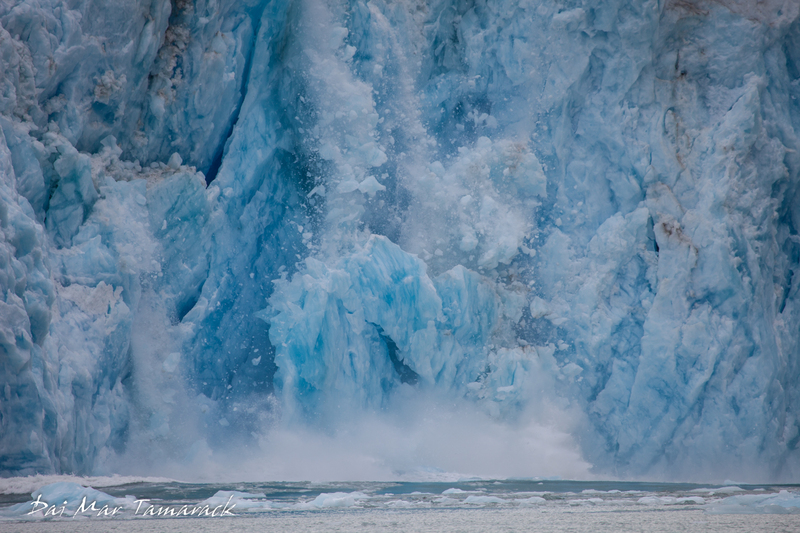 We were lucky enough to see some calving at Dawes glacier during our last two visits. 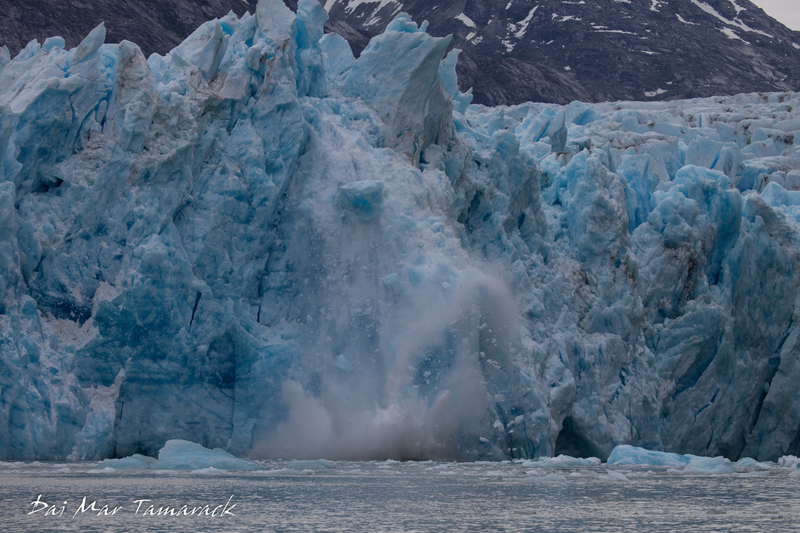 It is pretty southern as far as tidewater glaciers go, and very active. 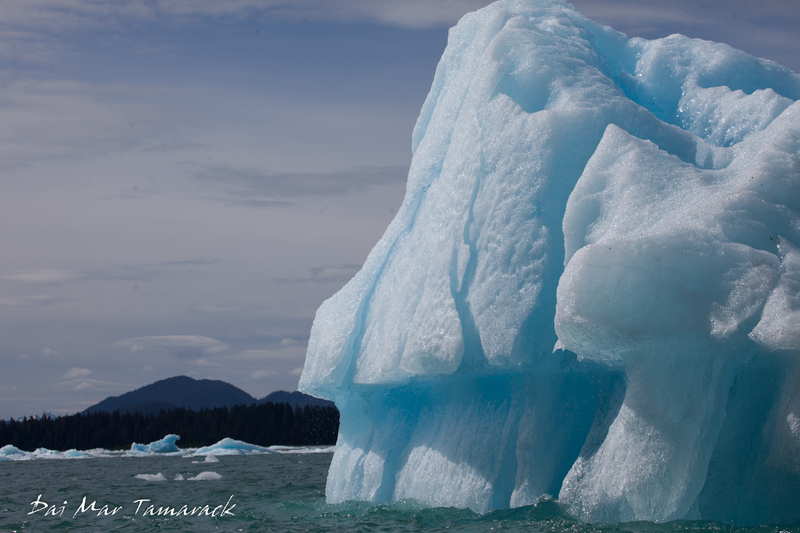 The long winding ride up to the glacier through Endicott Arm has been chocked full of ice bergs, hinting at the activity of the face of the glacier. 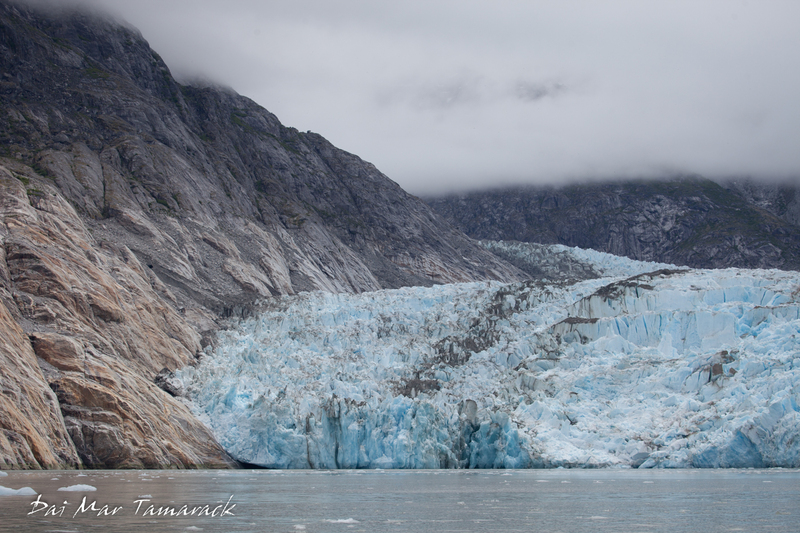 The 200 foot tall face of the glacier never ceases to amaze and confound me that something like it could actually exist. The fact that it is all created by snowflakes boggles the mind even more. 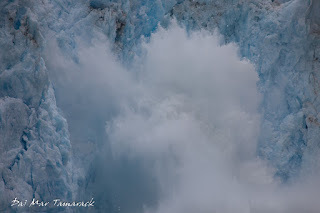 Check out the video below for a wild show of a huge calving glacier!! 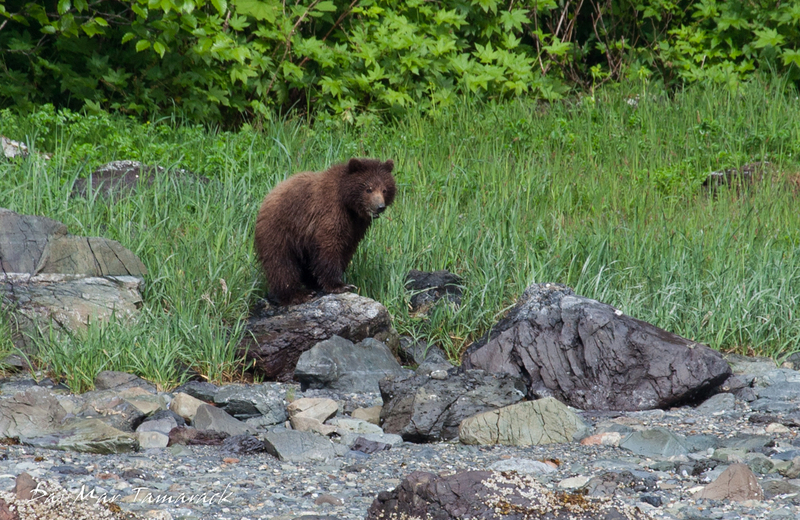 With our small group of five passengers this week we set up a special surprise visit to the Pack Creek bear viewing area on Admiralty Island. I have been wanting to go to this place ever since I started working in Alaska. 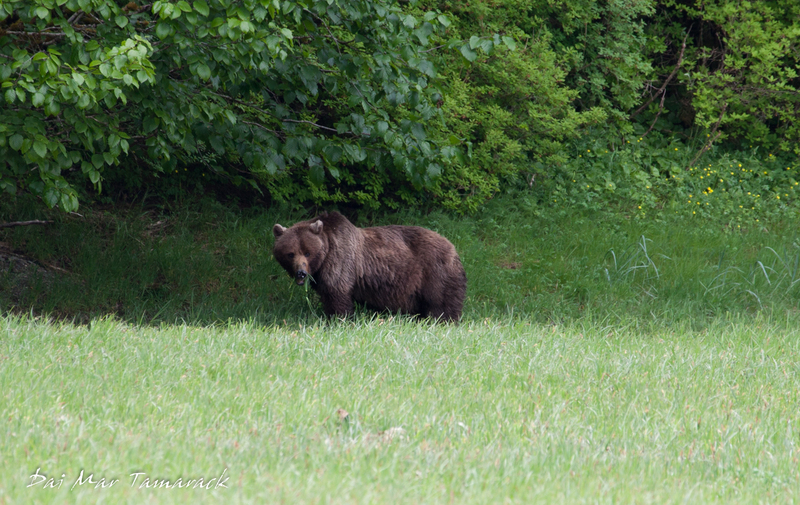 The meadow at Pack Creek shows up in almost every bear documentary filled with bears. We knew that visiting in June wouldn’t be crowded since it was in between mating time in May, and the salmon runs in July and August. But we thought we would stop in , check it out, and see if we got lucky. We had the manager of Pack Creek Bear Tours, Dan Kirkwood, fly in to show us the ropes and introduce us to the bears we might be lucky enough to come across. 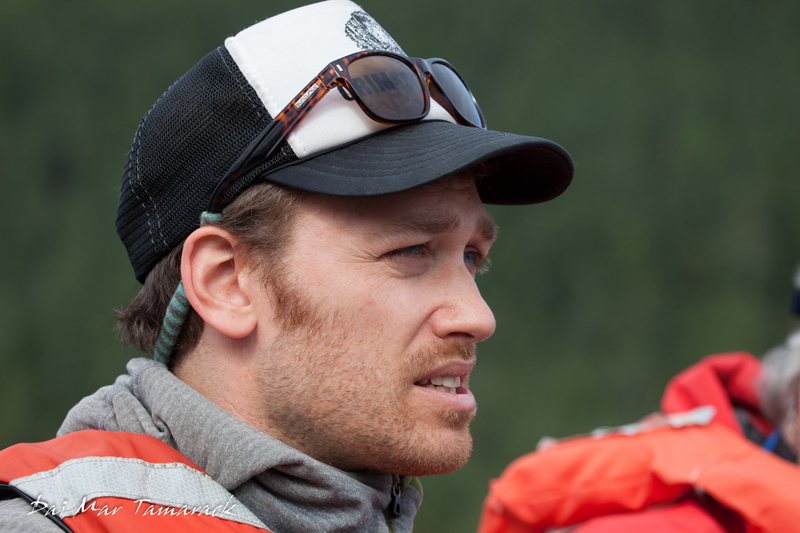 He has spent the last five summers guiding daily fly in bear viewing trips to Pack Creek. 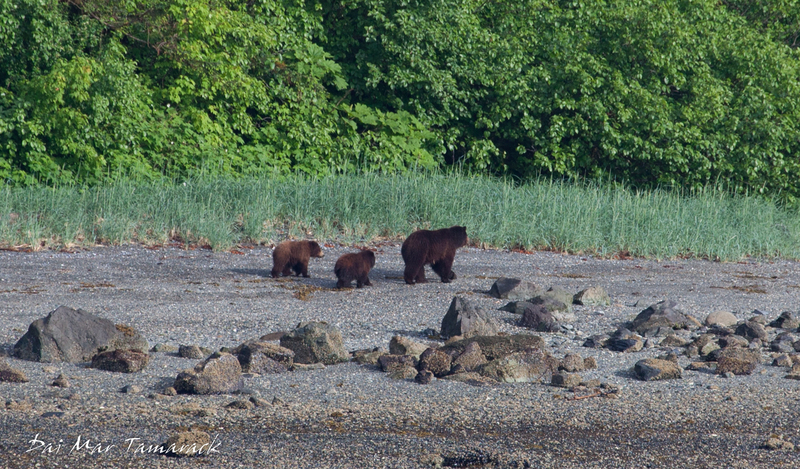 It looked like our lucky day when we awoke to a mom and two cubs playing and strolling along the shoreline. 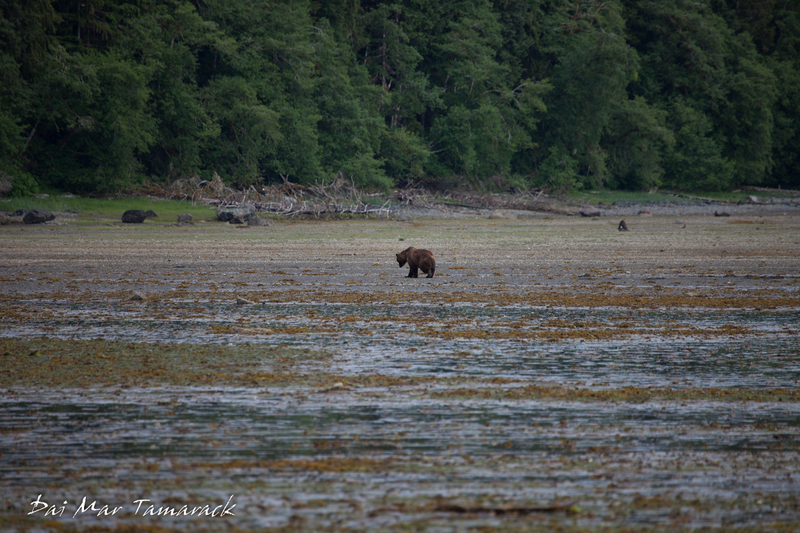 They stayed all during our breakfast, and then when our bear guide Dan flew in on a float plane, we jumped on our skiff and were excited to see the bears where still there. 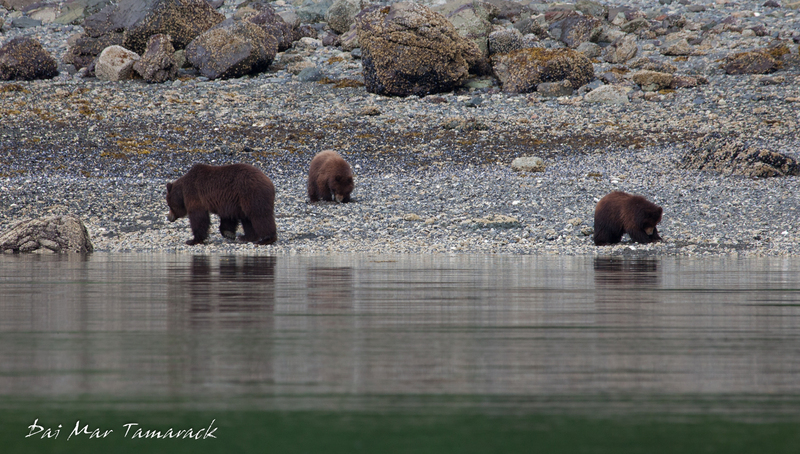 We were able to get a little closer in the skiff and with my long lens I was able to get some pictures showing just how fluffy these three bears where. 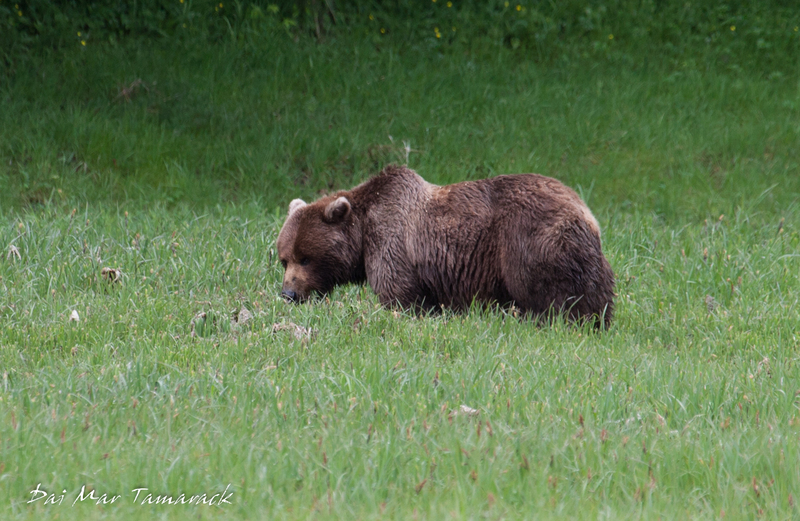 The two cubs were puffy little balls of fluff, seeming not to have a care in the world. At 9am the rangers showed up at their post on the beach so we skiffed in to check out the meadow. We immediately saw a big sow out in the mud flats digging around for clams. 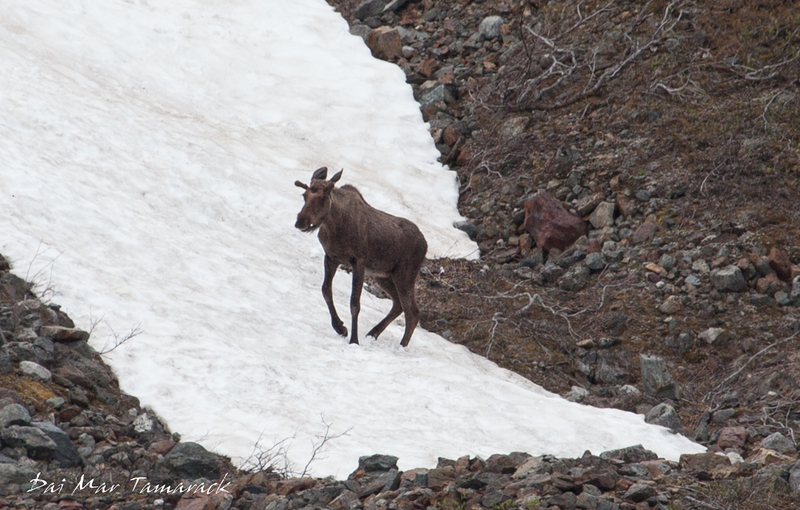 We stayed and watched her for awhile until she finally ambled off, right over the trail we were planning on going on. So we gave it a little time before taking a wide heading around her path. 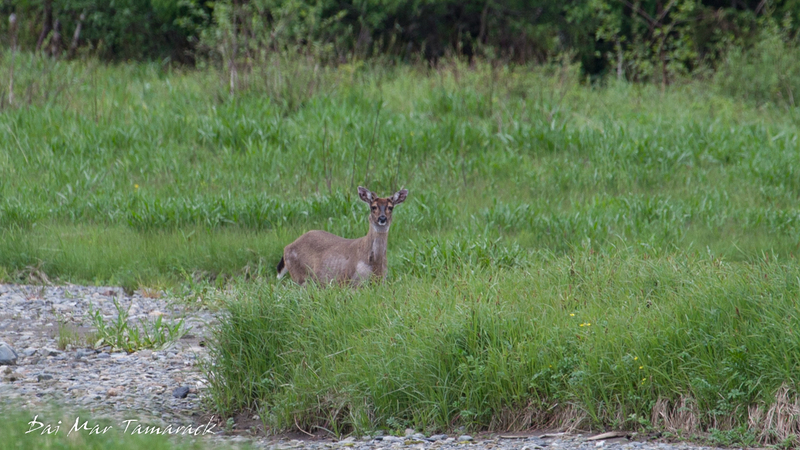 Then our luck continued as she has merely sauntered into the meadow where she casually chewed on sedge grass for the next forty five minutes right in front of where we were sitting. It was so refreshing to be able to sit there, in the bear’s house, and witness what this bear did and how it acted. We weren’t disturbing her and were merely onlookers into the life of one of the worlds largest land carnivores. 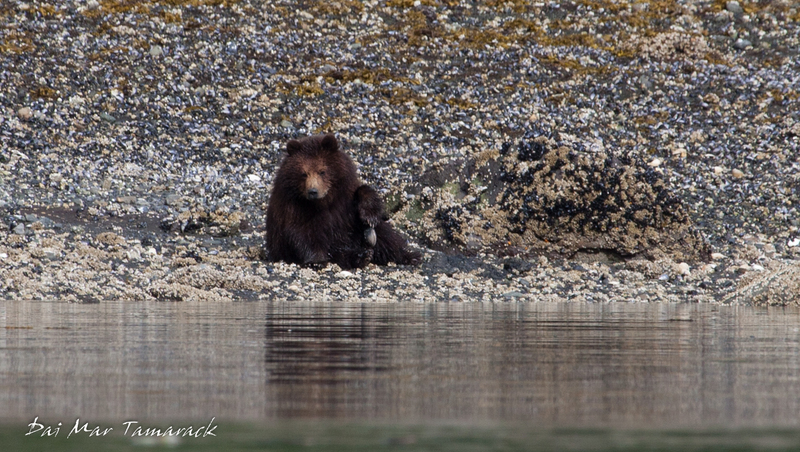 Often when we see bears here in Alaska it is from skiffs, or kayaks, or the big boats…with a bit of water in between us. It is a rare thing to be able to witness a bear while on land, and to have it stay with us for so long was a very special treat. So it turns out that Pack Creek can deliver even in June. Having the place all to ourselves was something else to cherish. How do they get so big by eating grass? 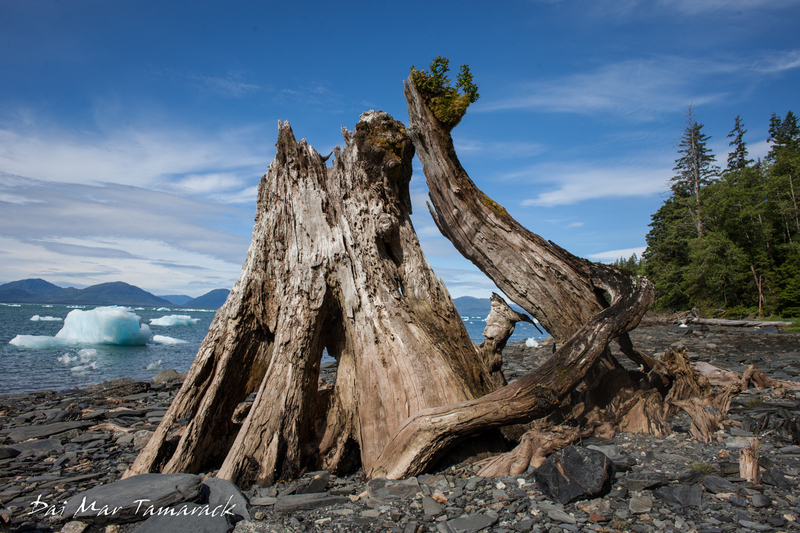 Link to a post on another spot on the bear viewing checklist in Southeast Alaska is Pavlov Harbor. 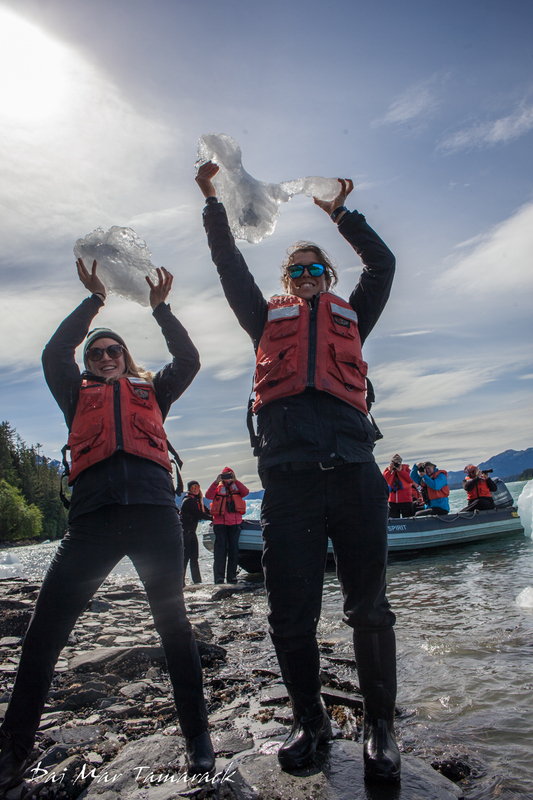 A huge ice field forms in southeast Alaska’s coastal mountains due to an immense amount of precipitation coming in off the Pacific Ocean. This prolific snowfall produces the southernmost tidewater glaciers in North America. 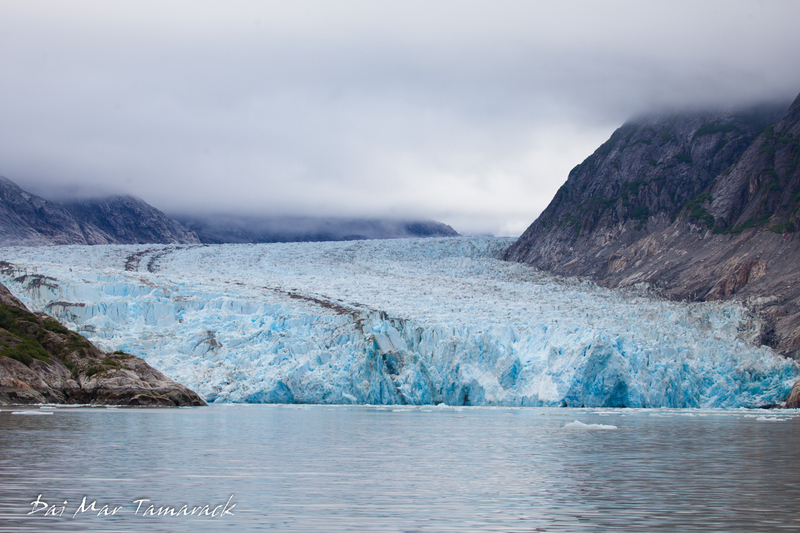 Le Conte Glacier is located near Petersburg, Alaska. 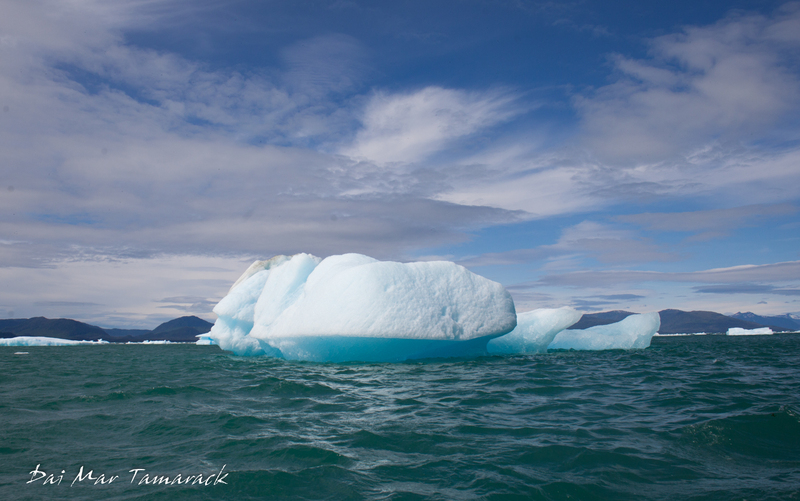 Due to its high level of calving events the twelve and a half mile fjord heading back to the glacier’s face is often too choked with icebergs for vessels to reach it. 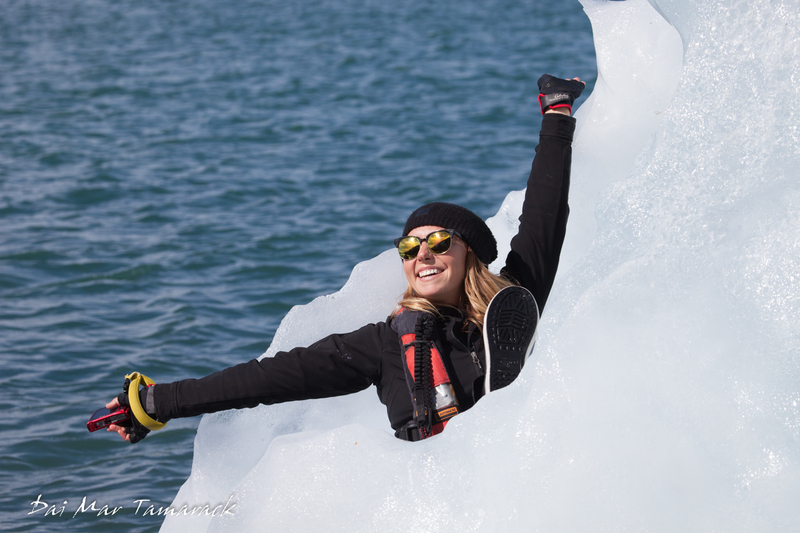 However, reaching the glacier’s face was not our goal this trip. What drew us to this area is an area I like to call Le Conte Ice Garden. The terminal moraine left behind when the glacier retreated creates a very shallow bar that often traps big pieces of ice inside the bay for months at a time. 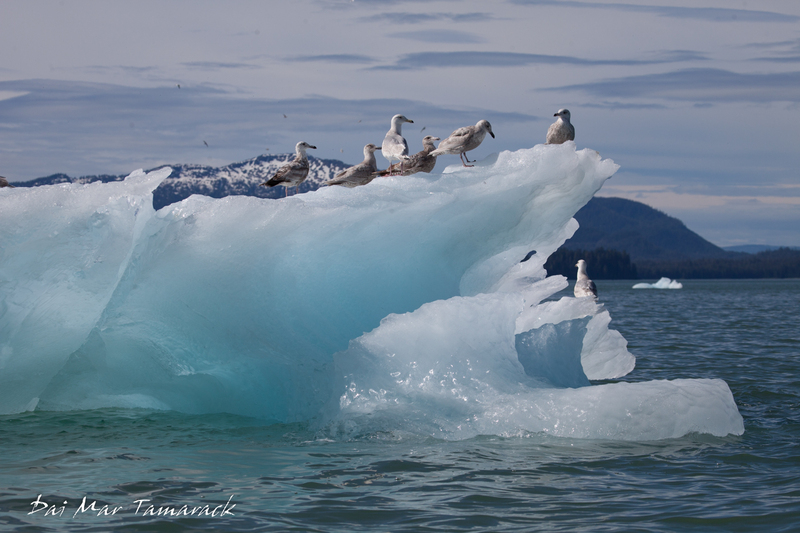 Here ice of all sizes floats around and is sometimes left high and dry on the shoreline when the large tidal drops occur. 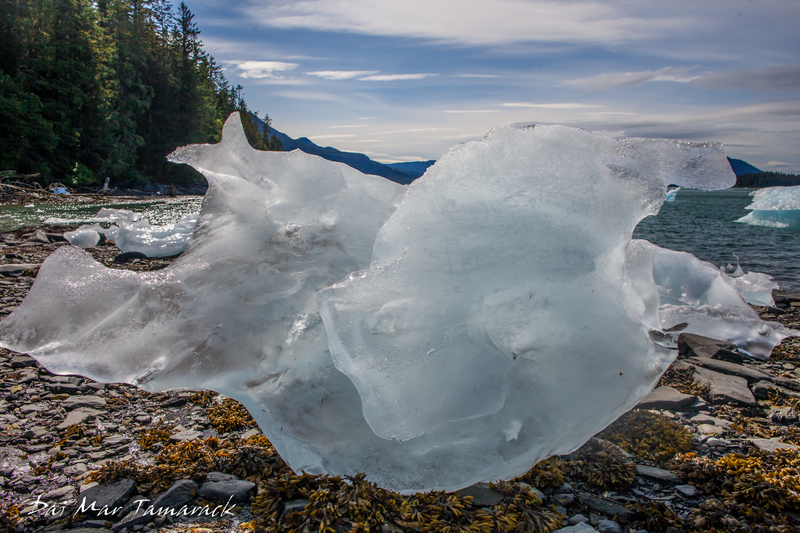 Walking along the shore at low tide can be like walking through an ice sculpture garden, only this artist was nature herself. 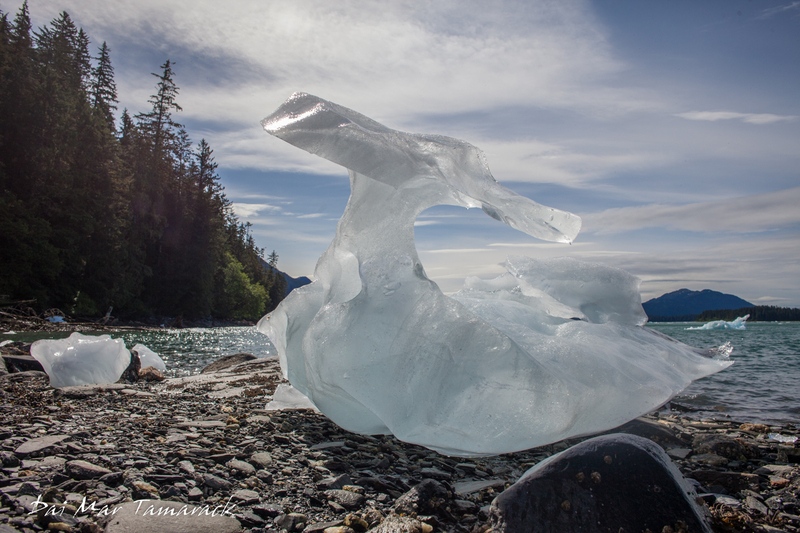 I put some of the best photos from this trip to the ice garden as well as others from around Alaska on my photo page which you can link to here. The forms of the slowly melting ice are endless. The guests and I wondered about them in awe. Watching them drip makes you realize that what you are seeing is just a fleeting moment in time, that no one else will see quite the same ever again. 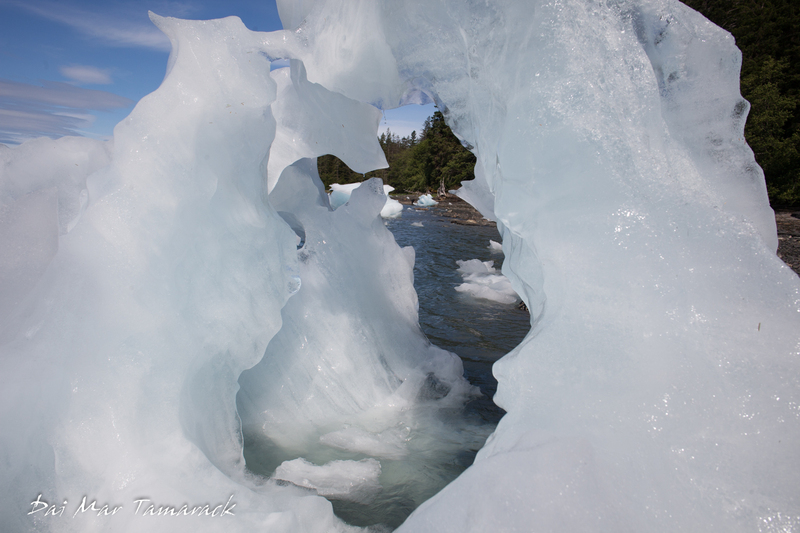 We skiffed and walked around the ice garden until it was time to head north towards whales and bears, but the images of the melting ice stay with us even now.